Nicole had a lot on her plate. As a single mom to 3 kids under the age of 12, her hands were already full. But she was also worked as a substitute teacher, was going to Seminole State College and living with her mother who had been sick in the hospital. When her mother got better, her mother decided she wanted to move to take care of Nicole’s grandmother who was suffering from dementia. While Nicole had a full-time position waiting for her at the start of the school year, she had the three-month summer period without steady income. And now, she needed to find a new place to live. Nicole stayed in hotels and with friends while waiting for her student financial aid to come in. However, there was a clerical error that meant she wouldn’t have any financial aid left over to help her with rent deposits like she had hoped. Her college advisor recommended she contact Destination Graduation. Destination Graduation is a unique partnership between Heart of Florida United Way, Seminole State College and SunTrust Foundation. The program assists students through an on-campus case manager to provide Emergency Financial Assistance in the hopes of reducing the number of students who leave for non-academic reasons. Nicole called Keren, the Destination Graduation navigator, and that’s when Nicole’s life began to change. Keren was able to provide community resources that helped Nicole start to get back on her feet. They stayed in contact. Nicole was on the wait list for income-restricted apartments, but was on a strict deadline to find housing by August 1. Worried that her kids would start the new school year living in a car, she was determined to find them a home in time. Nicole and her kids recently moved into their new home at the beginning of August. 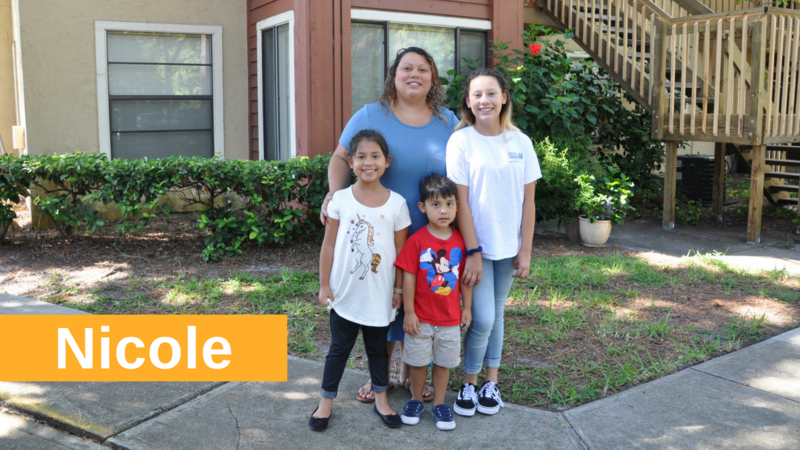 Her kids are excited to start school later this week and Nicole is looking forward to returning to work at Seminole Public Schools as a full time substitute teacher. She has three classes left to finish at Seminole State College to graduate with her Associate’s degree in Elementary Education.